I have to start by saying, the title of this post still makes me chuckle. 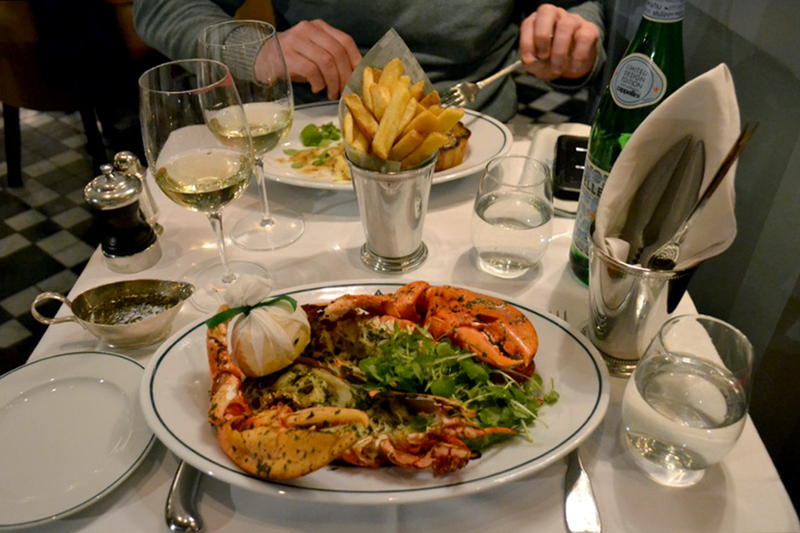 It’s not my usual type of title, nor really the way I’d explain how lovely our time was at The Ivy, however, our evening here led to my very first time attempting to shell and eat a full lobster. Absolutely cracking. *Wink wink* Back in September when the The Ivy had just opened, I stopped in for a blogger’s breakfast to get a taste and feel for what the new restaurant was all about. You can check out the full review here but long story short, breakfast was lovely, but I wasn’t blown away; although this wouldn’t have stopped me from going back for the lunch or evening menu. 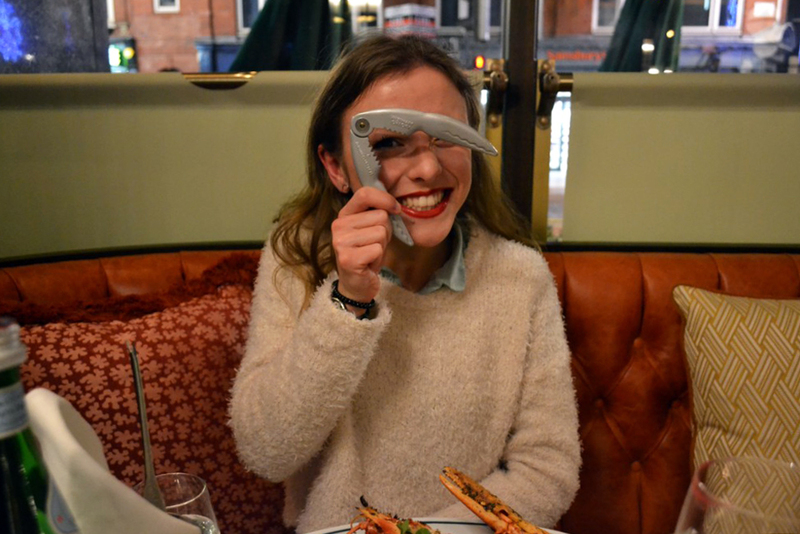 In fact, I was excited to try out their evening dishes – I had heard from so many people just how fabulous the food was. The restaurant downstairs was bustling, all the tables were busy with a great vibe to it, and my eyes kept following the fresh food being served. Service for the night was immaculate, informative, fun and someone who knew how to offer great recommendations. 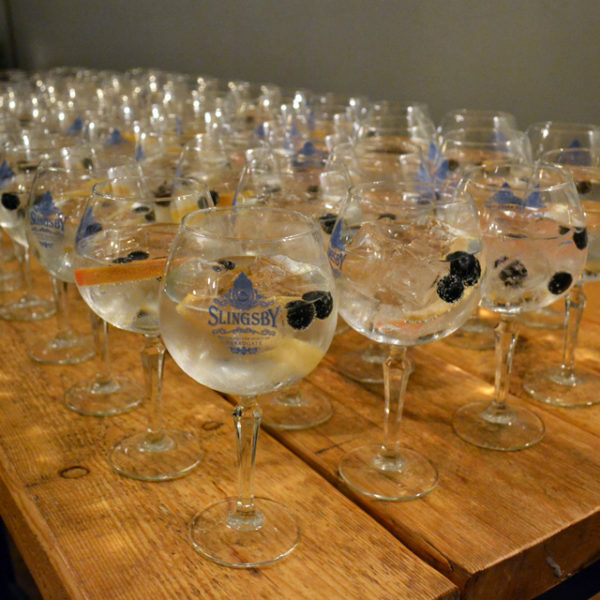 We started the evening with a little tipple. 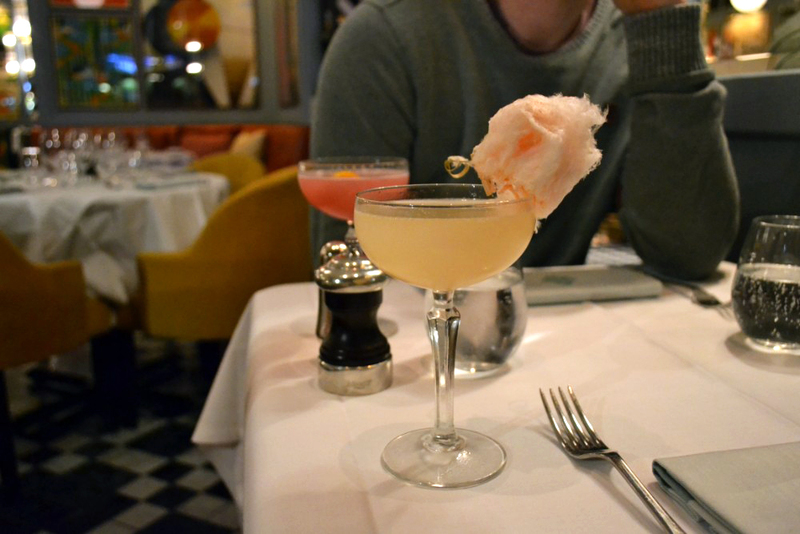 A sucker for a good old gimmick, I was lured in by a candy floss accessory, choosing the Candy Floss Fizz cocktail. 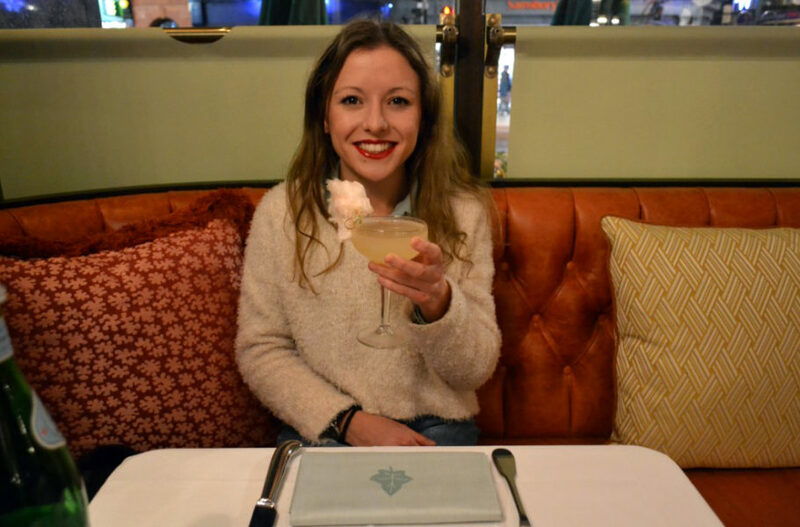 The drink itself was anything other than a gimmick – it was a well thought out and tantalisingly tasty concoction on prosecco, rosé, lychee, ginger and Havana 3-year-old rum. Nathan picked the Kirkstall Cosmo, a combo of Grey Goose A l’Orange, Cointreau, cranberry, peach bitters and lime. The cocktail was a great match to Nathan – refreshing, sharp and fruity. The aromas of the food brought on our hunger even more – so we were sure to make a quick decision for the starters. 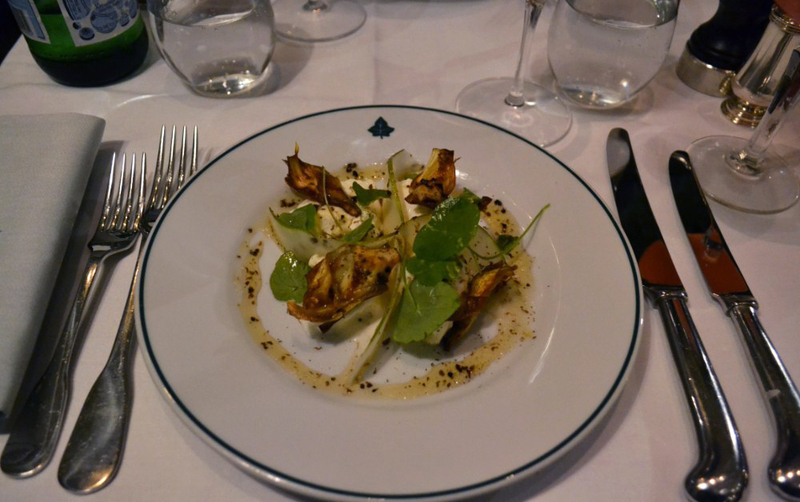 Nathan went for the Buffalo mozzarella with crispy artichokes, pear and truffle honey. 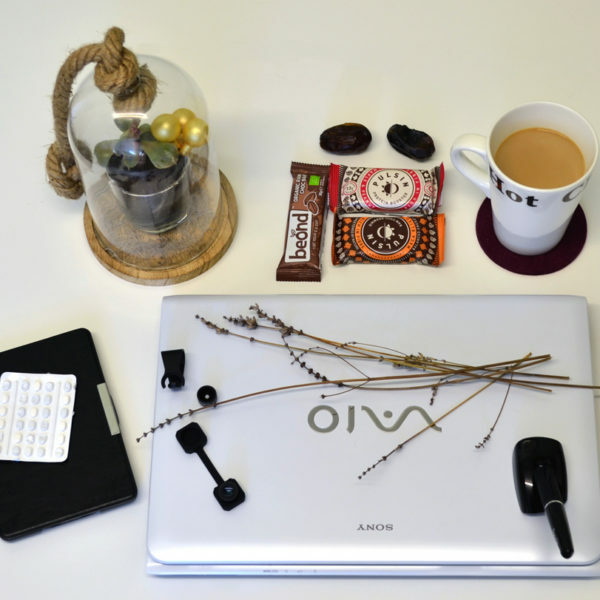 A perfect combined set of flavours and textures. Creamy and earthy, squishy and crispy. Surprise surprise, I spotted the roasted scallops and found the combination of the dish intriguing. The scallops were cooked well, and the grilled chorizo was a winning addition. 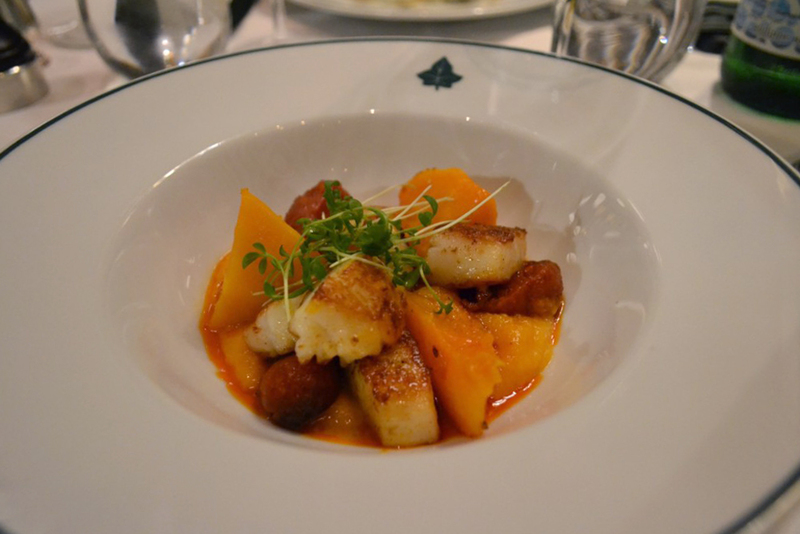 As for the ras el hanout roasted butternut squash, the texture seemed too soft to go hand in hand with the scallops and the flavours a bit too overpowering. With eyes as wide as saucers, the grilled whole lobster was the holy grail on the menu. Only once before have I had lobster, which was beautiful, and in that, it was already a pre-cut half. This dish was definitely on its way to me. Served with garlic and parsley butter (mmmmm…) and thick cut chips, I was overly excited for this delicate feast to arrive. 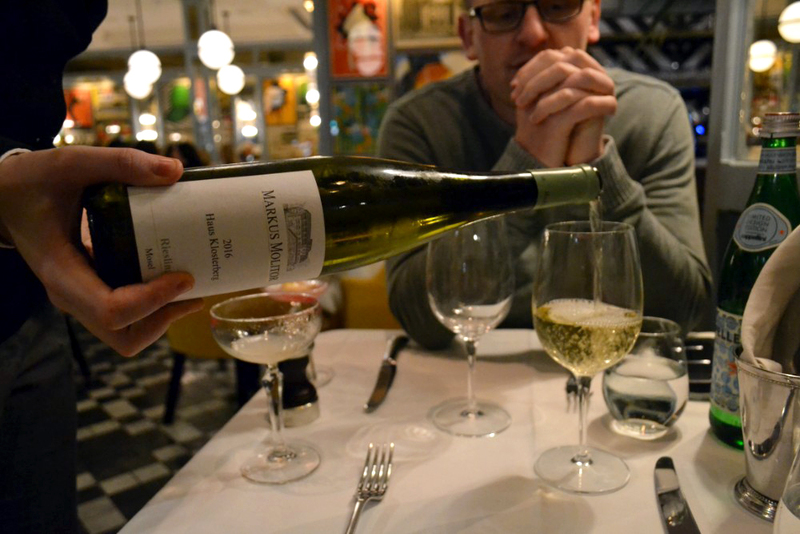 To accompany our mains and dessert, we were recommended a lovely bottle of Mosel Riesling, Markus Molitor, Haus Klosterberg. It was a great choice to complement my lobster, it was light and fruity, and a very easy to drink wine. My favourite part was that the grapes are from the River Moselle, as after my recent visit to Luxembourg, we drank Crémant with grapes from the same river. It’s a nice connection. Out first, came the lobster cracker and pick, followed by my after thought of how I’ve actually never tackled a full lobster before, let alone knew how to crack correctly. 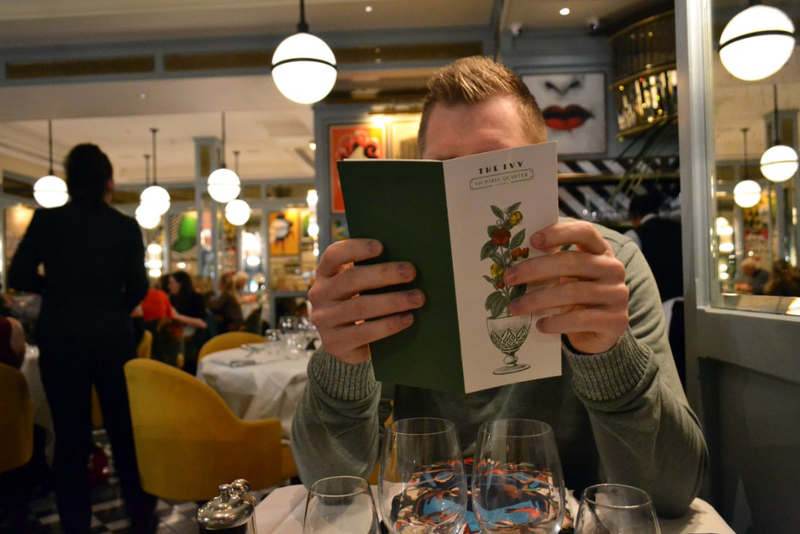 After some crucial advice from The Ivy, the cracking could commence with extra help from Nathan. Not quite as easy as expected, yet not as messy as what I had been warned for. The lobster was stunning, the meat was soft, with my favourite being the claw, flavoursome and then dipped into the sauce, I couldn’t get enough. I was thrilled with my dish. As an amateur lobster cracker, I was just about half way through when Nathan finished his meal. Going off-piste, Nathan asked what the special of the day was. 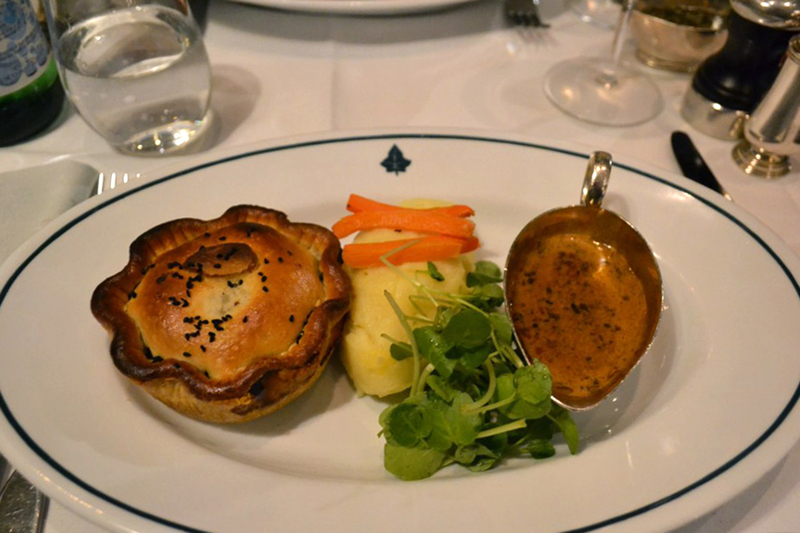 Game pie. He was straight in there and decided on that. The pie looked home-cooked and rustic. A good size for a casual fine-dining restaurant. Loaded with tender meats and a rich gravy, the crisp pastry case held well together, and once cutting into it, oozed and allowed for the ideal dipping sauce. As if the above wasn’t enough, we were tempted in by the dessert menu. 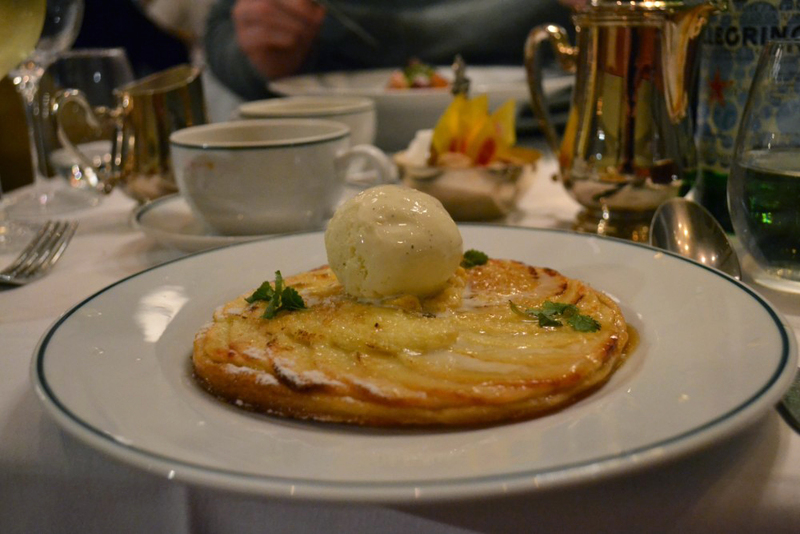 Recommended was the 15- minute baked apple tart, which was served with flambeed calvados. The apples had the perfect balance between sweetness and acidity, and the pastry thin and crispy pastry. The hot calvados caramelised the sugar coating and added another scrumptious layer of fruity flavours. 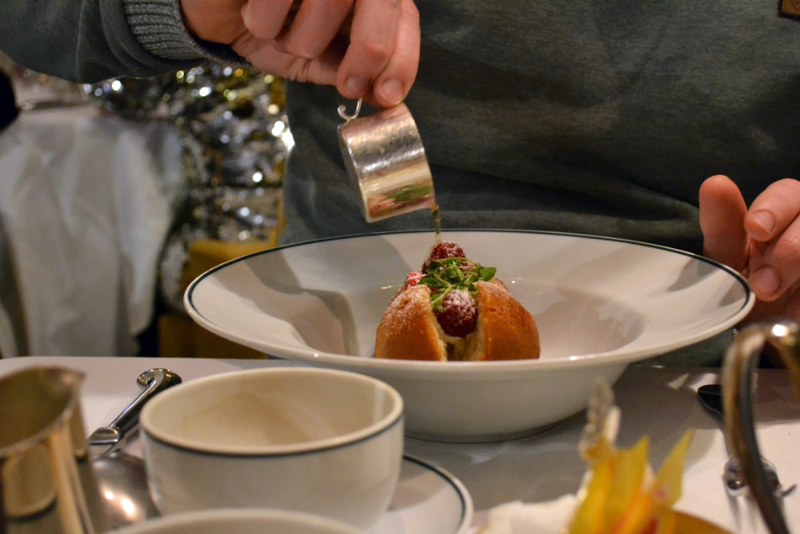 Nathan picked the Rum baba dessert, which was a rum soaked sponge with Chantilly cream and raspberries. It was light and fluffy and was very pleasing to the eye. A solid dessert choice. And to bring the night to a close for us, we finished with a coffee cream, chatting away over what our favourites of the night was. 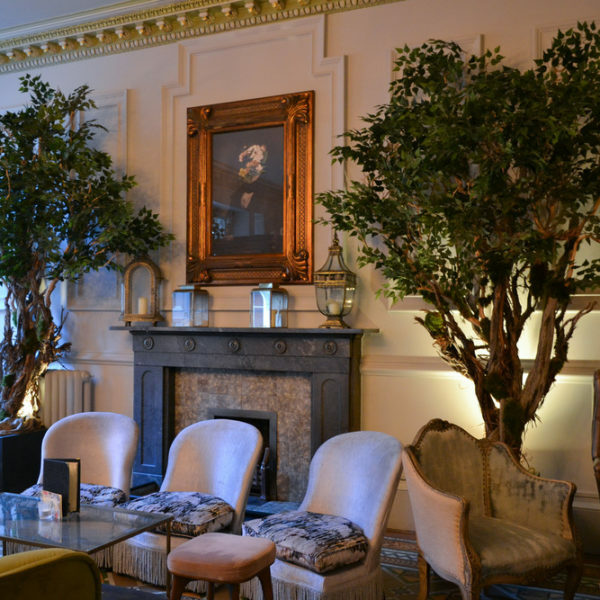 We had a lovely time at The Ivy – with a humming restaurant vibe, being well looked after by knowledgeable staff, and truly enjoyable food. We shall look forward to another visit when their spring summer menu arrives. 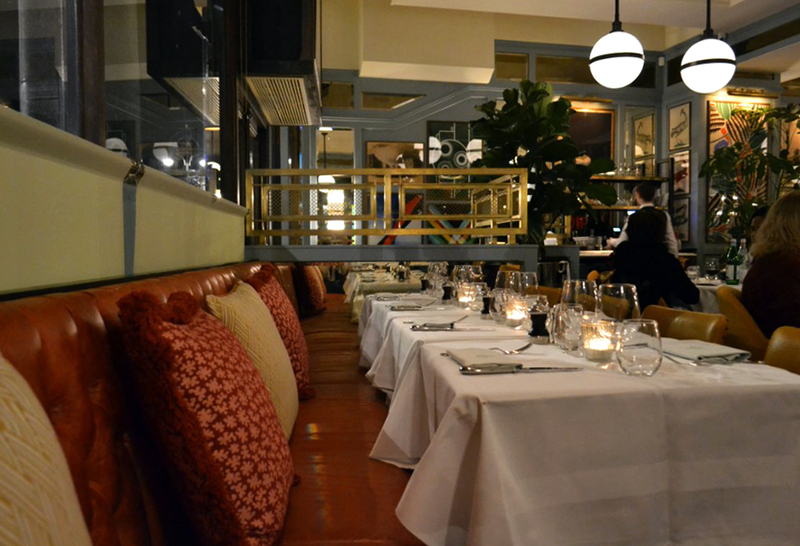 Have you been to The Ivy before? PS. 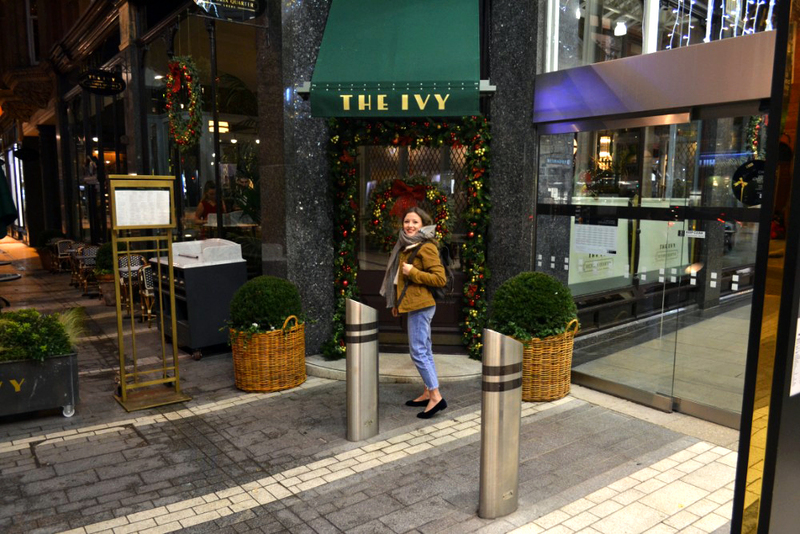 I was invited to review The Ivy in return for a blog post. As with every review, my thoughts and opinions are my own, and completely honest and transparent.